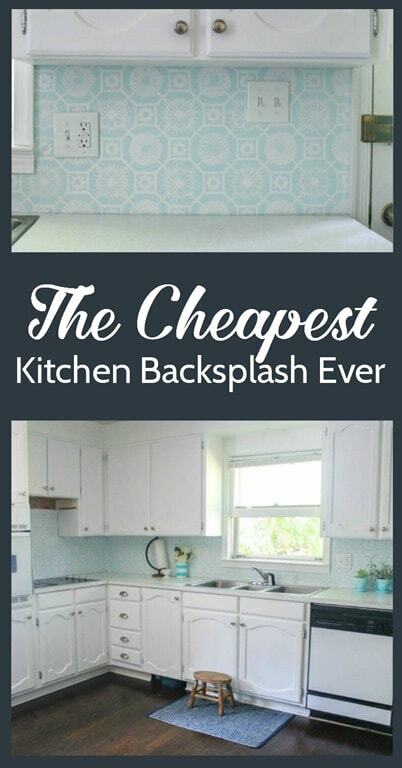 The Cheapest DIY Backsplash Ever - Lovely Etc. The budget kitchen makeover continues! Today I’m sharing my new backsplash, which is arguably the cheapest backsplash ever. (That’s cheap as in low-cost, save-your-money-for-something-more-important. Not cheap as in inferior.) Any guesses what I used to made the cheapest backsplash ever? If you guessed paint, you know me well. 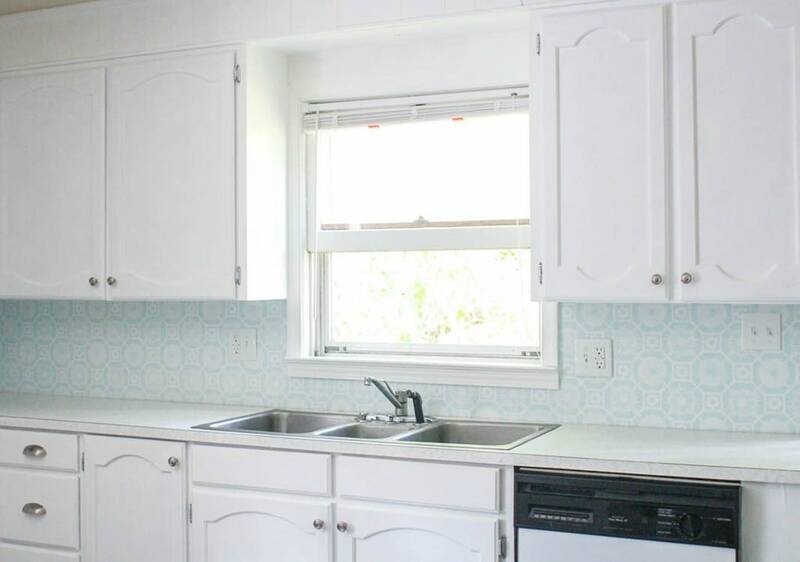 My freshly painted cabinets completely transformed my kitchen, but I never dreamed a painted backsplash could also make such a huge difference. This post is sponsored by StencilGirl Products. As always, all opinions are my own. This post may contain affiliate links. Please see my full disclosure here. Previously, we still had the laminate backsplash from when the house was built in 1973. Functionally, it was perfect. Aesthetically, it was horrendous. I have absolutely nothing against a laminate backsplash – in fact I’ve seen some really beautiful ones. Mine was not one of those. It was that lovely gold and white speckled laminate that everyone loved in the 70s. (The better to match our harvest gold appliances my dear. Evil laugh.) And not only that, it was super thick in a weirdly noticeable way. As in it dwarfed the actual window trim, it was so thick. And if painting is my favorite, stenciling is my favorite favorite. As soon as I saw this antique tiles stencil from StencilGirl, I knew it was going to make an amazing backsplash. 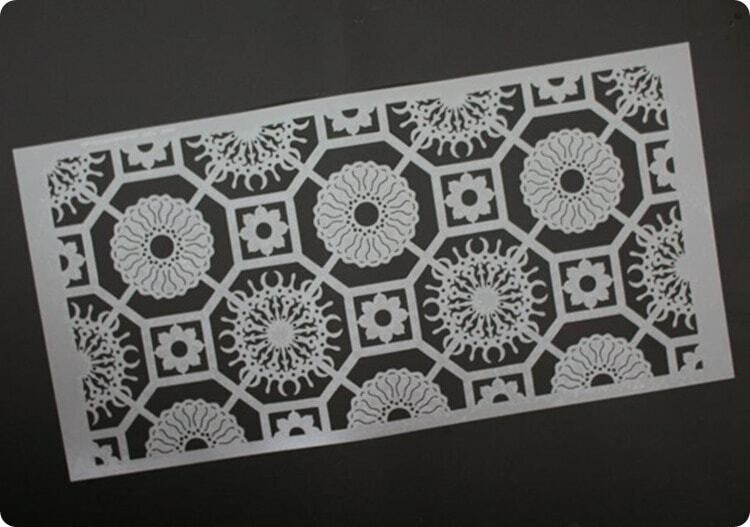 StencilGirl is a new to me stencil company that recently came out with a line of home décor stencils. The stencils are all designed by artists and made in the USA. Plus, StencilGirl is a family-run company which I love. 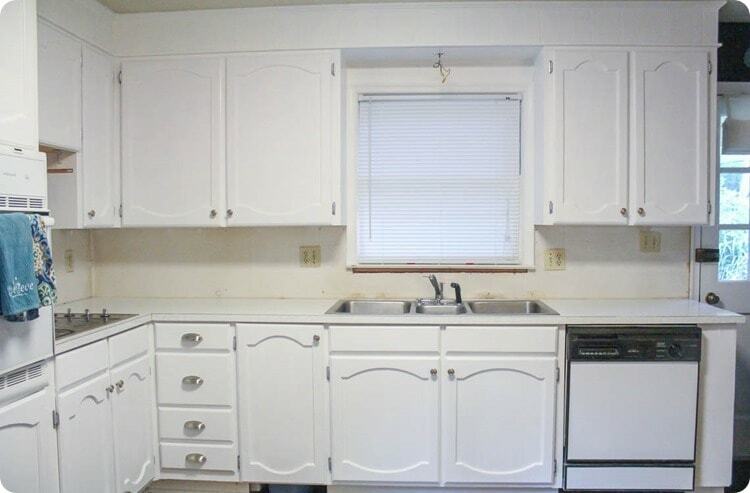 I did hesitate briefly at first, wondering if paint would be durable enough as a backsplash. But then I remembered that plenty of builder-grade houses come with a painted wall ‘backsplash’. (Theirs just aren’t as cute as mine!) Just make sure to use semigloss paint. 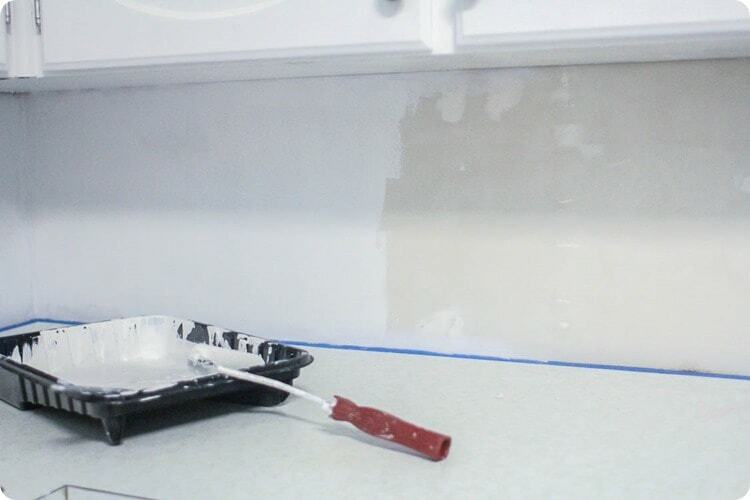 Semigloss paint is great for resisting moisture if water gets splashed on the wall and is easy to clean. Both of which are essential for a backsplash. First, you need a flat surface to stencil. It could be drywall, laminate, or even flat tiles. I chose to remove our previous laminate backsplash before stenciling because of the weird thickness of it, but stenciling the laminate would have worked just as well. If you are stenciling a laminate backsplash, you’ll start by lightly sanding the entire thing with sandpaper to rough up the surface a bit, cleaning it well with a degreaser (I prefer plain old Dawn dish soap) and painting a coat or two of a good primer. If you are stenciling drywall like me, you may need to patch a few holes to ensure your surface is perfectly flat. After removing my old backsplash, I had quite a few nail holes to fill as well as some dents from the removal process. I used spackling to fill these holes and then once it was dry, sanded it smooth with 320 grit sandpaper. Once everything was nice and smooth, I wiped the wall down well to make sure it was clean and dust-free and then it was time to paint. Before you start, make sure to protect your countertops, outlets, cabinets, and anything else touching the backsplash with painter’s tape. Then begin by painting the base coat using a foam roller. 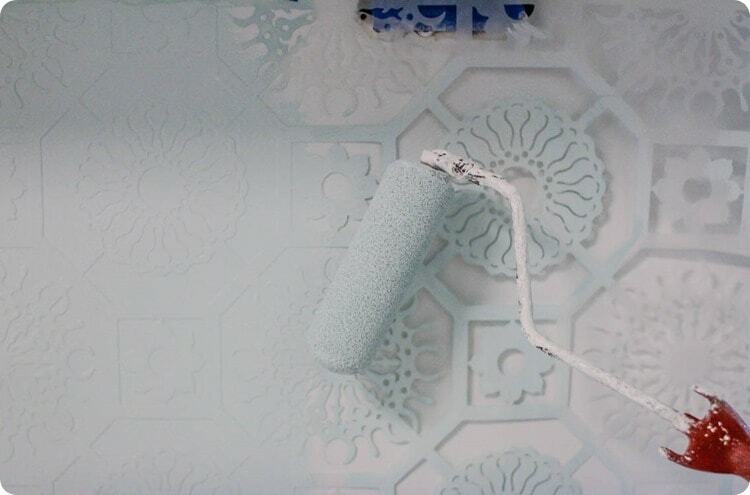 The base coat for this stencil is the ‘grout’ color; I used a bright white semigloss paint. Once that dries, it’s time to stencil. I prefer to stencil using a foam roller as well. The trick is to make sure you don’t load too much paint on the roller at a time. Load your roller with a light layer of paint and then lightly roll it over some paper towels to remove any excess. Using painter’s tape, tape your stencil to the wall. I find it easiest to start in a corner. Then just lightly roll your roller over the stencil until all of the open spaces are evenly painted. Then gently pull the stencil off the wall. To do the next section, simply line the stencil design up with the previous section and keep going. The thing that is really tricky about stenciling the backsplash is reaching the spots right below the cabinets and right above the counter. To get in those little areas, you will have to bend your stencil into a 90 degree angle. Since the foam roller won’t work well in such tight corners, you can use a small foam brush or a stencil brush to gently fill in those parts of the stencil. If your design starts to look a little messy and not so crisp, that simply means it is time to clean the excess paint off your stencil. And if you find that there are any areas that don’t look quite as good as you would have liked, you can simply repaint them your base cover and then stencil over them again. That is the marvelous thing about paint – it is so forgiving. And we have a backsplash! This is such a great stencil for a backsplash. When my family came over, they couldn’t stop talking about how much it looks like real tile and I have to agree. And even though we still have a long way to go with this budget kitchen makeover (countertops, lights, appliances, faucet, etc. ), I think it looks pretty darn great. Just look at the difference a painted backsplash and some fresh outlets made. Now I cannot wait to tackle those countertops! I’d love for you to pin this project and share it with all of your friends in need of a budget kitchen makeover! This is stunning! 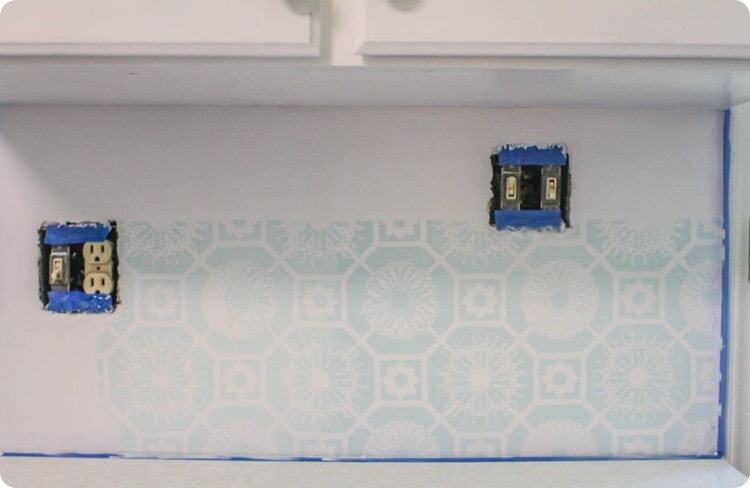 I never would have thought to stencil a backsplash, but it’s lovely! I love this idea! So much easier than tiling! Thanks Kristin! It definitely is! That looks fantastic! We’ve been putting off the backsplash because we don’t know how to tile – but this looks awesome and we could do it. Thanks Stephanie! You could totally do this! This looks amazing!! I’m in the middle of a backsplash project right now (like seriously, right now. I’m procrastinating by reading your post! ), and yours looks a hundred times easier than mine!! Wishing I had gone this route! Shhh… don’t tell my husband I said that! Haha, thanks Natalie. 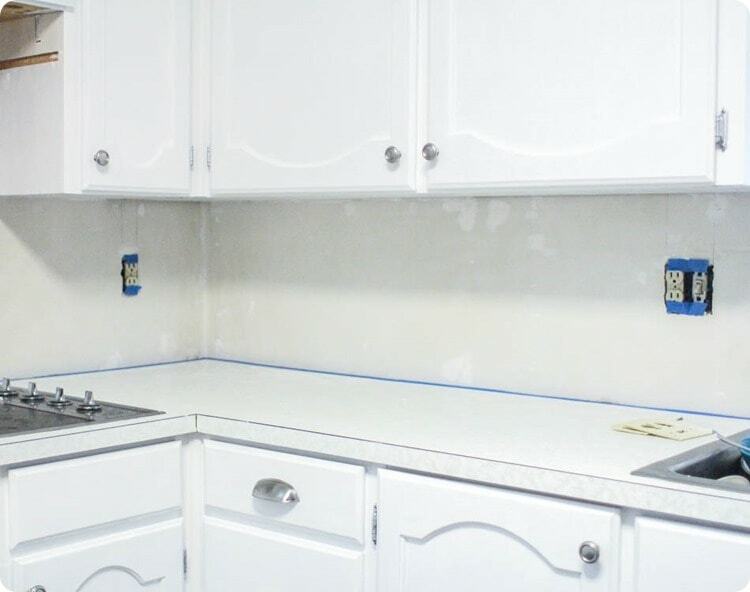 There were a few tricky spots with the stencil for sure – but it was way quicker than a traditional backsplash! Oh wow! 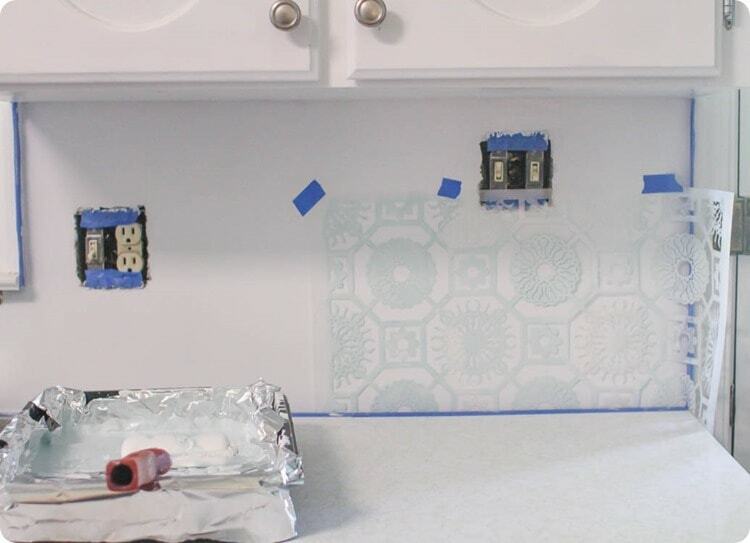 I never would have thought to stencil a backsplash! Great idea! Thanks Jenna! 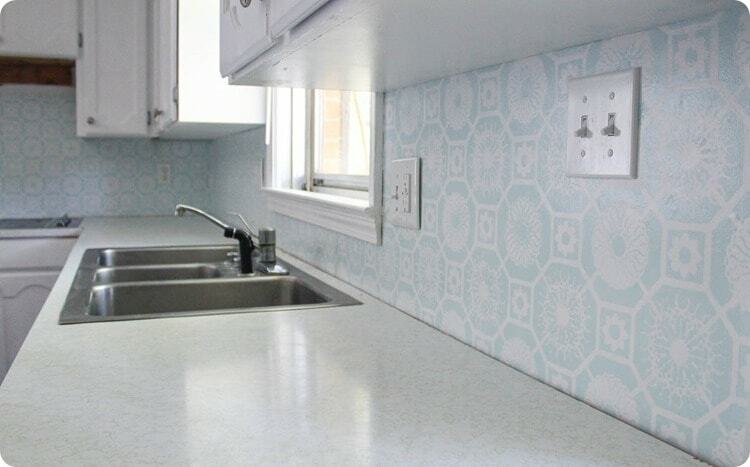 A stencil makes a surprisingly great backsplash! Thanks Gretchen – I totally agree! Would you please share, where you found your paper towel holder? It’s the coolest holder I’ve ever seen!!! Thanks so much Rena! I am loving the backsplash too. 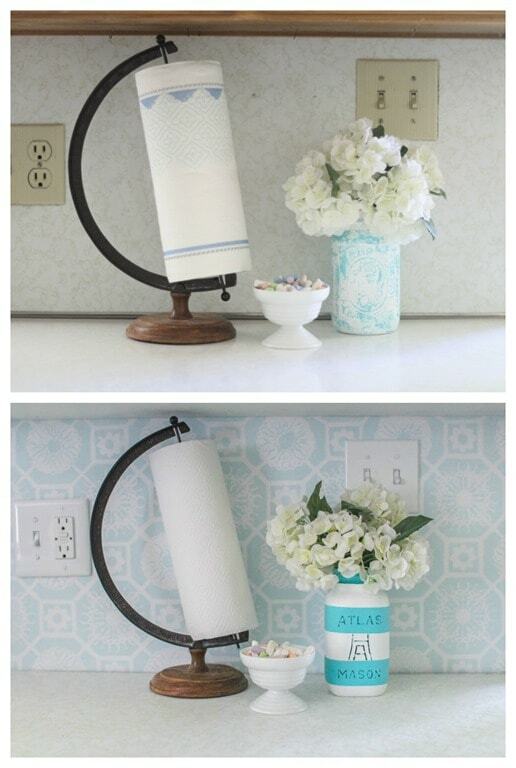 The paper towel holder is a repurposed globe stand. I found the globe at a yard sale and hung the actual globe part from the ceiling in my son’s nursery. I didn’t need the stand it came with anymore and it just happened to be perfect to hold paper towels. It was a really lucky accident! OMGosh! You are 1 Gutsy Lady! I would end up with a globby mess under the stencil but you DID explain the process very well. So maybe even I could do something like that – like a border around my craft room. Thank you Nancy – I definitely think you could do it. Stenciling looks much harder than it is. As long as you don’t overload your brush/roller with paint, you should have great results! OMG this is so beautiful Carrie. You always bring many creative ideas! I used to visit your site once a day to read only one post (I do the same to other blogs). However, looks like I should spend more time for your blogs since your posts are really inspired! Hi Carrie love your backsplash,it is beautiful.looks like very expensive tiles. Thank you Mary! I love it too! Hi! I love the backsplash! I got married 3 years ago and moved into a house with black cabinets. I hate black!! My husband keeps promising that we will work on the kitchen and get new cabinets. (organization is a disaster because no sufficient thought was put into it) But the money is just never there! So I decided that I will paint the cabinets Crisp French Blue and walls an almost white with a hint of pink. I hope it looks good! 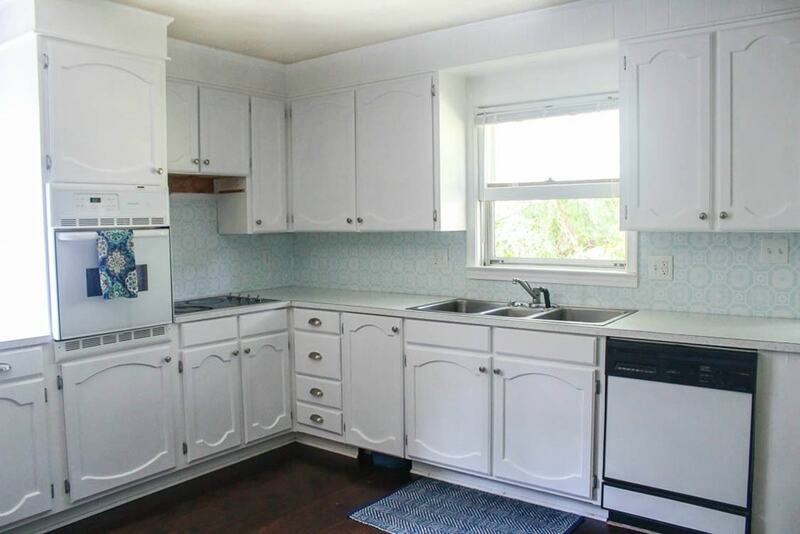 I am thinking of doing the backsplash like you did yours but with the same blue as the cabinets. I’m think that the backsplash will come out looking like a mosaic tile! Only problem is that I have some texturing on the walls. It’s normal texture that you see on most walls. Do you think that it might work? Also I’m wondering if you did the canning jars that are on your countertop? And how did you do them? I’m in love! Hi Angela, You sound a lot like me – I get tired of waiting for ‘someday’ and just start doing things myself! Your kitchen colors sound beautiful! The wall texture will make the stenciling more difficult, but wouldn’t be impossible. Our backsplash was smooth drywall so I didn’t have to deal with texture. 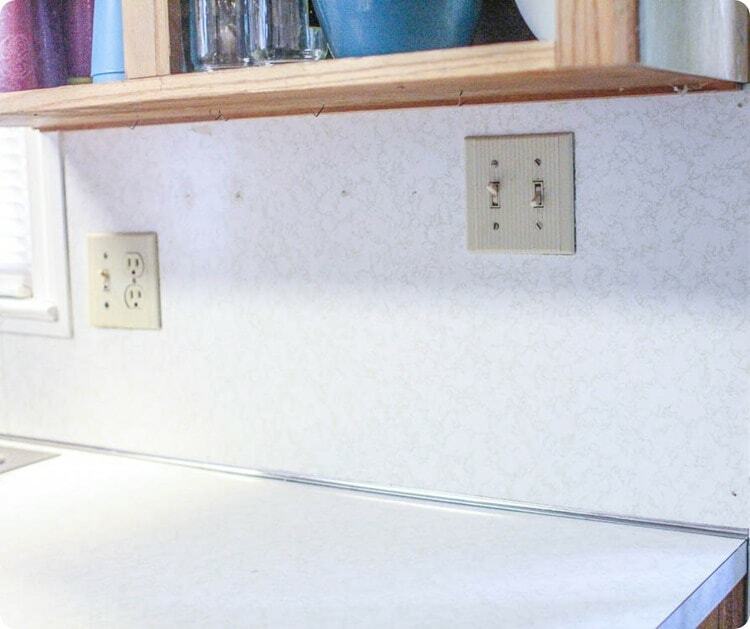 One possible solution would be to create a backsplash by cutting smooth hardboard to the size of the space between your cabinets and counter and then paint and stencil that. (This is one solution I had considered). You can buy hardboard at Lowes or Home Depot – it’s smooth, thin, and inexpensive. It’s kind of like the old wood paneling from the 70s but without any fake paneling texture. This really fits my pocket book.I love it.